Augustine’s dominant image for the human life is peregrinatio, which signifies at once a journey to the homeland (a pilgrimage) and the condition of exile from the homeland. For Augustine, all human beings are, in the earthly life, exiles from their true homeland: heaven. Only some become pilgrims seeking a way back to the heavenly homeland, a return mediated by the incarnate Christ. Becoming a pilgrim begins with attraction to beauty. The return journey therefore involves formation, both moral and aesthetic, in loving rightly. This image has occasioned a lot of angst in ethical thought in the last century or so. Augustine’s vision of Christian life as a pilgrimage, his critics allege, casts a pall of groaning and longing over this life in favor of happiness in the next. Augustine’s eschatological orientation robs the world of beauty and ethics of urgency. 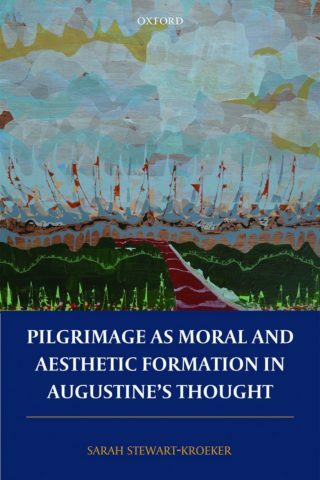 In Pilgrimage as Moral and Aesthetic Formation in Augustine’s Thought, Sarah Stewart-Kroeker elaborates Augustine’s understanding of moral and aesthetic formation via the pilgrimage image, which she argues reflects a Christological continuity between the earthly journey and the eschatological home that unites love of God and neighbor. From the human desire for beauty to the embodied practice of Christian sacraments, Stewart-Kroeker reveals the integrity of Augustine’s vision of moral and aesthetic formation, which is essentially the ordering of love. This study develops an Augustinian account of the relationship between beauty and morality.